1987-02-05. New. Ships with Tracking Number! INTERNATIONAL WORLDWIDE Shipping available. Buy with confidence, excellent customer service! Annapolis, Maryland: Naval Press, 1986. Advance Uncorrected Proof. Hardcover. Very Good/VG+. Rare advance corrected proof copy, undersized to the actual book, but wrapped in pre-publication dustjacket in the same as the hardcover when published. The design of the dw is the same as the hardcover issue but the copy differs from what was eventually issued; different copy for the narrative summary oon the front flap, and promotional mateiral on back panel instead of supporting blurbs from other authors and notables. UNCOMMON. Naval Institute Press. Hardcover. 0870212001 First edition, First Printing. Fine in Fine dust jacket. An Exceptional copy of the author's first book. * books carefully packed and shipped promptly . Fine. Annapolis, Maryland: Naval Institute Press, 1986. Hardcover. Fine/Fine. First edition. Fine in fine dustwrapper. Although not marked in any way, this copy is from the distinguished modern first edition collection of Bruce Kahn. US Naval Institute Press, 1986. First edition. First Edition. Hard cover. New in fine dust jacket.. Sewn binding. Paper over boards. 329 p. Audience: General/trade. Naval Institute Press, Annapolis, Maryland, U.S.A., 1986. Hardcover. Book Condition: As New. Dust Jacket Condition: Fine. 1st EDITION, FULL NUMBER LINE. 8vo-over 7?-9?" tall. Author's first book printed by the Naval Institute Press, just as Tom Clancy's "The Hunt for the Red October". Quarter bound in black, w/metallic spine lettering, over gray boards. Clean, clear crisp black end papers encase this book. This is the FIRST JAKE GRAFTON novel. Not a remainder. Dust jacket not price clipped. This PRISTINE FIRST EDITION will make a WELCOMED and VALUED addition to your collection. ENJOY! Read it. It is very good! This HIGHLY DESIRABLE BOOK is in FLAWLESS CONDITION. AB90 In this riveting story of naval aviators at war over Vietnam, veteran A-6 Intruder pilot Stephen Coonts captures as never before the full drama of modern aerial warfare. With extraordinary realism he straps the reader into the cockpit of an A-6 to experience the fear and exhilaration of life at full throttle: thrilling cat shots off a carrier...treetop-level races against pursuing MIGs...treacherous night landings in crippled planes. With unfailing honesty he puts the reader inside the hearts and minds of the pilots who "drive" these powerful, hi-tech machines to reveal a world unknown to those outside the naval aviators' fraternity. From the good natured raillery of the ready room to the shared dangers in the air to the manic release from combat stress in the bars of the Philippines, the airmen's special brand of camaraderie-the one stabilizing force in their otherwise precarious lives-is described here as only an insider could. More than an exciting adventure story, Flight of the Intruder probes beneath the glamorous surface to examine the psychological tolls of war. Through the memorable characters of Jake Grafton and his squadron buddies Tiger Cole, The Boxman, Sammy Lundeen, and New Guy, Coonts explores the ways in which naval aviators attempt to cope with the intense pressures of their profession. For Jake, a once-innocent love of flying has given way to guilt and frustration-and an urgent need to give meaning to the deaths he feels responsible for. The consequences of his conduct lead up to a final, gut wrenching scene that will leave readers thinking about this moving novel long after turning the last page. Stephen Coonts makes an auspicious debut as a writer with this lucid, authentic, and deeply reflective book. Condition: New in fine dust jacket. New York: Naval Institute Press, 1986. Author's First novel SIGNED by the AUTHOR on the Title page. Signature only A First edition, First printing. Book is in Near Fine condition. Boards are clean, not bumped. Fore edges have a tiny bit of shelf wear. Interior is clean and legible. Not remaindered. Dust Jacket is in Near Fine condition. Not chipped or crinkled. Not price clipped. Dust Jacket is covered by Mylar Brodart. Thanks and Enjoy. All-Ways well boxed, All-Ways fast service. Thanks.. Signed by Author. First Edition. Hard Cover. Near Fine/Near Fine. Annapolis, Maryland, U.S.A.: Naval Inst Pr, 1986. 1st Edition . Hardcover. As New/As New. 8vo - over 7¾ - 9¾" tall. Stephen Coonts first novel. This impeccable first edition/first printing is a best buy of all listed. Correct full number line sequence, no writing, marks, underlining, or bookplates. No remainder marks. Spine is tight and crisp. Boards are flat and true and the corners are square. Dust jacket is not price-clipped. This highly collectible as new condition first edition/first printing copy is protected with a polyester archival dust jacket cover. Outstanding offering, you will not be disappointed! 1990-02-03. New. Ships with Tracking Number! INTERNATIONAL WORLDWIDE Shipping available. Buy with confidence, excellent customer service! 2006-06-09. New. Ships with Tracking Number! INTERNATIONAL WORLDWIDE Shipping available. Buy with confidence, excellent customer service! Annapolis, Maryland: Naval Institute Press. Hardcover. 0870212001 fresh and beautiful copy of author's first book. sale. 10% off regular price of 130.00. now . Fine. 1986. First Edition. 2015-12-29. New. Ships with Tracking Number! INTERNATIONAL WORLDWIDE Shipping available. Buy with confidence, excellent customer service! Annapolis, MD: Naval Institute Press, (1986). First edion. Near fine uncorrected proof in red paperwraps, in dust jacket. INSCRIBED by the author on the half-title page, "To Goldie/ Hope you enjoy this little flying story & sell a ton of 'em/ Best wishes/ Stephen Coonts. 2010-11-29. Good. Ships with Tracking Number! INTERNATIONAL WORLDWIDE Shipping available. May not contain Access Codes or Supplements. May be ex-library. Shipping & Handling by region. Buy with confidence, excellent customer service! 2014-08-07. Good. Ships with Tracking Number! INTERNATIONAL WORLDWIDE Shipping available. May not contain Access Codes or Supplements. May be ex-library. Shipping & Handling by region. Buy with confidence, excellent customer service! 2014-08-07. New. Ships with Tracking Number! INTERNATIONAL WORLDWIDE Shipping available. Buy with confidence, excellent customer service! Bookcassette. Used - Very Good. Very Good condition. Audio Cassette. Case Very Good. Unabridged edition. 4 cassettes. Quality guaranteed! In original artwork/packaging unless otherwise noted. 2015-09-03. New. Ships with Tracking Number! INTERNATIONAL WORLDWIDE Shipping available. Buy with confidence, excellent customer service! 2006-02-09. New. Ships with Tracking Number! INTERNATIONAL WORLDWIDE Shipping available. Buy with confidence, excellent customer service! 1986-09-02. New. Ships with Tracking Number! INTERNATIONAL WORLDWIDE Shipping available. Buy with confidence, excellent customer service! 1987-11-01. Good. Ships with Tracking Number! INTERNATIONAL WORLDWIDE Shipping available. May not contain Access Codes or Supplements. May be ex-library. Shipping & Handling by region. Buy with confidence, excellent customer service! Annapolis: Naval Institute Press, 1986. First edition. Hardcover. A fine copy in dust jacket. Author's first novel. Naval aviators at war over Vietnam, veteran A-6 Intruder pilot Coonts, captures as never before the full drama of modern aerial warfare. 329pp. 2013-06-04. Good. Ships with Tracking Number! INTERNATIONAL WORLDWIDE Shipping available. May not contain Access Codes or Supplements. May be ex-library. Shipping & Handling by region. Buy with confidence, excellent customer service! 1987-01-01. Good. Ships with Tracking Number! INTERNATIONAL WORLDWIDE Shipping available. May not contain Access Codes or Supplements. May be ex-library. Shipping & Handling by region. Buy with confidence, excellent customer service! Naval Institute Press, 1986. 1st Edition. Hardcover. Fine/Fine. 8vo - over 7¾ - 9¾" tall. 8vo., 329pp. Beautiful First Printing, square tight and clean throughout with no discernible flaws. Equally attractive un-clipped wrapper protected with an archival-quality mylar cover. A stunning collectable copy signed by the author on the title page. Author's first book. 2015-12-29. Good. Ships with Tracking Number! INTERNATIONAL WORLDWIDE Shipping available. May not contain Access Codes or Supplements. May be ex-library. Shipping & Handling by region. Buy with confidence, excellent customer service! Annapolis: Naval Institute Press, 1986. 1st. Hardcover. Fine/fine. Bound in the publisher's original black quarter cloth and grey boards, spine stamped in gilt. Authors first book. Annapolis, MD: Naval Institute Press, 1986 First Printing of the First Edition. Author's first book. Book and dust jacket in fine condition. 1987-07-01. Good. Ships with Tracking Number! INTERNATIONAL WORLDWIDE Shipping available. May not contain Access Codes or Supplements. May be ex-library. Shipping & Handling by region. Buy with confidence, excellent customer service! Annapolis, Maryland: Naval Institute Press. 1986. Fifth Printing. Hardcover. 0870212001 . Near Fine in a Near Fine dust jacket. Light soiling to front panel. ; 9.30 X 6.30 X 1 inches; 329 pages; Original unclipped dust jacket protected by archival Brodart cover. All domestic orders shipped protected in a Box. . Naval Institute Press (1986) First Edition, blind stamp, nr fine/nr fine. First Edition. ANNAPOLIS: NAVAL INSTITUTE PRESS. 1986. Fine. 1986. First Edition. Hardcover. Fine in a fine dj. Author's FIRST book. (B) . Very Good+ in Very Good- dust jacket. Softcover. Better than VG+ in VG- oversize DJ. Annapolis: Naval Institute Press, 1986. 1st Edition, Pre-publication dust jacket is about 3/4  larger than the galleys. Wear (rubbing) is heaviest at both ends of spine, and at folds. In red wraps, states uncorrected galleys. Fiction Vietnam A-6 Aircraft Military Fiction . First Edition. Hardcover. Fine/Near Fine. Signed! Hardcover first edition / first printing. Fine book in fine jacket, not price clipped, Signed on a custom designed bookplate and is author's signature only. Minimum scuffing and edge wear. No writing or marks. Comes with Certificate of Authenticity for author's signature. Your books ship to you with protective mylar jacket, bubble wrapped in cardboard box. Annapolis MD: Naval Institute Press, 1986. 329 pages. Pages clean, v/g condition. Black endpapers spotless. Quarter bound with black cloth over grey boards. White title on spine. Grey dust jacket illustrated in red and yellow with black title. DJ not price clipped. NF/VG+. 1st Edition. Hard Cover. Annapolis, Maryland, U.S.A.: Naval Institute Press, 1986. Book. Fine. Hardcover. Signed by Author(s). First Edition. 1986 Naval Institute Press First Edition/First printing **SIGNED ** on the half-title page and in F/F condition with only a price clip..
"The Flight Of The Intruder"
Weighing 1 lb. 11 oz., this book has 329 pages. Annapolis, Maryland: Naval Institute Press, 1986. 329 pp. Black endpapers. Quarter black cloth with silver titles. Corners lightly bumped. Grey DJ, not price-clipped. VG+/Near Fine.. First Edition. Hard Cover. 8vo - over 7¾" - 9¾" tall. 1990-02-03. Good. Ships with Tracking Number! INTERNATIONAL WORLDWIDE Shipping available. May not contain Access Codes or Supplements. May be ex-library. Shipping & Handling by region. Buy with confidence, excellent customer service! 1987-02-05. Good. Ships with Tracking Number! INTERNATIONAL WORLDWIDE Shipping available. May not contain Access Codes or Supplements. May be ex-library. Shipping & Handling by region. Buy with confidence, excellent customer service! Annapolis, Maryland: Naval Institute Press. 1986. First Edition; Third Printing. Hardcover. Very Good in a Very Good dust jacket. ; 9.10 X 6.10 X 1 inches; 329 pages; Original unclipped dust jacket protected by archival Brodart cover. All domestic orders shipped protected in a Box. .
Annapolis, MD: Naval Institute Press. Fine in Fine dust jacket. 1986. First Edition; First Printing; Signed by Author. Hardcover. 9780870212000 . A Fine first edition/Printing in alike dust-jacket. Signed and inscribed by author Stephen Coonts on half-title page; . Annapolis, MD: Naval Institute Press. Near Fine in Fine dust jacket. 1986. First Edition; First Printing; Signed by Author. Hardcover. 0870212001 . 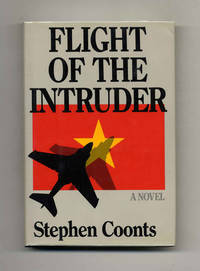 A just about Fine first printing of the first edition, tips slightly bumped in Fine dust-jacket, signed by author Stephen Coonts on the half-title page; Perspective of wartime from the cockpit of an Intruder A-6 during the Vietnam War and what psychological havoc war can cause for those most closely involved .